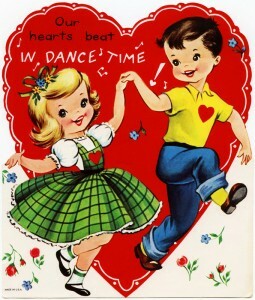 In elementary school the few days leading up to Valentine's Day were full of anticipation. We were given a list of names of all of our classmates. Mom had to take us to the store to choose a box of valentines. Hmm. Cutsie hearts, kitties and puppies or cartoon superheroes? Selecting the right one was such a big deal and I would look first at this box then that one. Some of them even had glitter! Ooh yeah, I always went for those. The day before the holiday during art we were supplied with pink, red and white construction paper, white doilies, glue, crayons, scissors...the whole craft shebang! What was this bounty of supplies for? It was to make “The Envelope” that we would tape on our desks and would hold all of our precious valentine cards! It was so much fun creating something unique that was all our own. That evening at home was spent choosing a valentine for each classmate, addressing it with their name and signing our own, making sure, of course that the ones given to the boys wouldn't be considered too mushy or romantic because boys had Cooties! Eww!! It seemingly took forever but after all, our class always had at least thirty kids. With all the contemplation and consternation over who would get which one it probably took over an hour at least! The next day was the Valentine's Day party! Classwork ended an hour early and the festivities would begin. We would go from desk to desk passing out our special missives with silly sayings like “I Choo-Choose You” with a drawing of a train or “Don't mean to be Corny, but will you be my Valentine?” with a cartoon corncob. Then, the door would open and in came the Room Mother with cupcakes and punch and sometimes even those little plastic cups of ice cream that came with flat wooden spoons! Oh my!! The remainder of the day was spent eating and drinking pure sugar, opening our cards, completing Valentine's Day coloring pages or dot-to-dots and generally goofing off and running amok until the last bell. It's funny how simple experiences like that stay within a person's memory when so many other things fade away in time. I chose to feature Strawberry Cheesecake Bread this week because to me these plump red berries have always been reminiscent of the shape of hearts., that very classic symbol of Valentine's Day! Do you have any special Valentine's Day memories from childhood? How do you plan to make the day special? Leave your comments below. We'd love to hear from you! 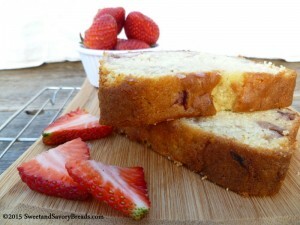 Tangy cream cheese and bits of sweet, fresh strawberries flavor this super moist sweet bread! Preheat oven to 350 deg F. Grease and flour a 9x5 inch loaf pan or spray with vegetable cooking spray. Set aside. In a large bowl cream softened cream cheese, butter and sugar together with hand or stand mixer until fluffy. Mix in the eggs, one at time. Add the almond extract and continue to mix until well combined. Either stir with a spoon or mix on low speed the dry ingredients and the milk into the creamed mixture alternately by thirds just until combined. Be careful not to over-mix. Place berries in a small bowl and toss with 1 Tablespoon flour. This step will help prevent them from sinking during the baking process. Gently fold in the strawberries with a spoon. Turn the batter into the prepared loaf pan. Bake in preheated oven for 50-60 minutes or until golden brown and a toothpick inserted in the middle comes out clean. Remove from oven and let set in the pan five minutes then remove to a wire rack to continue cooling. Wrap any leftover bread tightly to preserve freshness and plan to use within three days. To make sour milk place 1/2 Tablespoon lemon juice or white vinegar in a measuring cup. Add milk to the 1/2 cup line and allow to stand a minimum of 5-10 minutes. 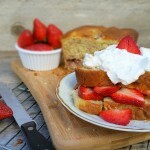 Strawberry Cheesecake Bread serves as a delicious base for shortcake with fresh sliced berries and whipped cream. Wrap leftovers tightly to preserve freshness and consume within three days. Posted in Breakfast Breads, Quickbreads, Sweet Loaves for GiftingTagged bread, breakfast, cheesecake, cream cheese, eggs, loaf pan, strawberry, sweetBookmark the permalink.